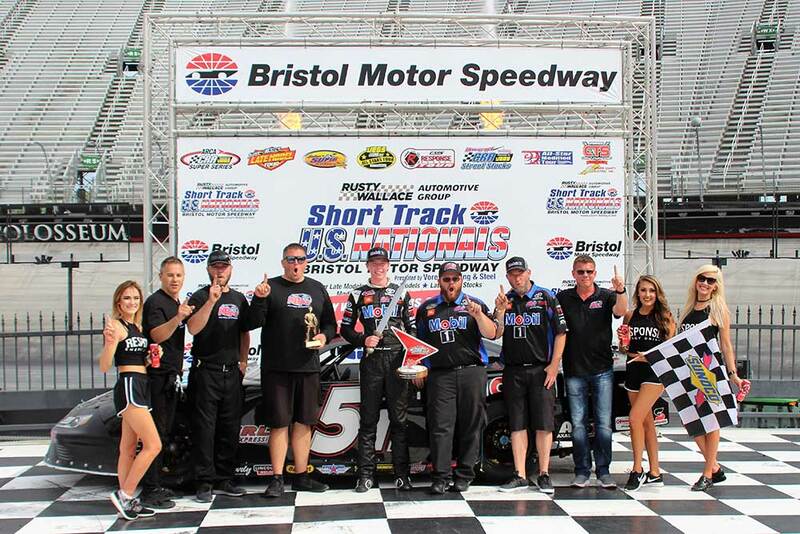 Raphael Lessard led 56 of 100 laps, including the final 24, en route to victory in Sunday’s Super Late Model Feature of the Short Track U.S. Nationals at Bristol (Tenn.) Motor Speedway. Lessard’s victory in the second annual event was the first for the 16-year-old Canadian in seven starts since joining Kyle Busch Motorsports (KBM) at the start of the 2018 season. The No. 51 FRL Express/Mobil 1 race team qualified fifth and after an eight-car invert took the green flag from the fourth position. After two early cautions, Lessard made his way to the front for the first time on lap four and would remain out front until lap 35 when he was passed by Trevor Noles. Lessard ran comfortably behind Noles in the second position saving his equipment during the middle stages of the 100-lap event. The talented youngster was just behind the leader with 25 laps remaining when Noles made contact with a lap vehicle. Lessard took advantage of Noles problems and was able to retake the lead on lap 77. Once out front the Toyota Racing Development driver began pulling away from the field. Lessard had nearly a four-second lead on NASCAR Camping World Truck Series regular Stewart Friesen when Noles hit the wall after developing a tire rub with six laps remaining. Lessard used a strong restart to break away from the field again and ended up crossing the stripe 1.221 seconds ahead of Friesen. The win was the second marquee win of 2018 for KBM’s Super Late Model team. Kyle Busch won the Winter Showdown at Kern Country Raceway Park in Bakersfield, Calif. in February. The No. 51 FRL Express/Mobil 1 team will be back in action with Lessard June 9 for the CARS Super Late Model event at Anderson (S.C.) Motor Speedway. What does it mean to get your first win for Kyle Busch Motorsports? Lessard’s win in the second annual event adds to the long list of victories for KBM’s Super Late Model team.